Do you like to have cheese (yes just cheese, not cake) for dessert? I do. Many years ago, I had a neighbor who's from Belgium that we're friend with, she loved to use our big kitchen (as her mother-in-law converted the kitchen to three bedrooms...) to cook for party. Everytime she had cheese for dessert, but I hadn't ever been influenced, I was still faithful to ice-cream, cakes, pies, etc. But it just happens suddenly in this year... after a lovely meal at restaurant, my stomach is comfortably full but not stuff, feeling fruit being too light and cake being too overwhelming to round up the meal, so I have little cheese (which is usually cut into very thin, and accompanied with mamarlade-alike topping). That's exactly hit the spot! Maybe next time I'll take some photos to the local cheese... and for this time, absolutely without a fuss, let me make non-bake cheese(cake), still delightful and super-easy to do. The dessert has high calories though, so takes it moderately, a small portion can go a long way. Well combine the white chocolate, cheese and agar-mixture. 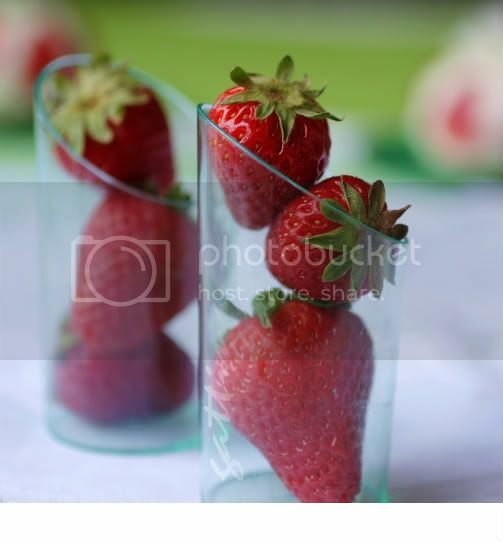 Line 4 tea/coffee cups with cling wrap, place the strawberry slices around the sides, spoon in the cheese mixture. Chill them for 5 hours. Place a cookie on a serving place, unmold the cheesecake, remove the plastic and put it above the cookie, garnish with more strawberry. Mmmhh, surely divine! So pretty. Absolutely Lovely. I like the ingredients that have gone into your cheese cake. I am not really fond of them but the kids love them. Looks so pretty! Love your take on the cheesecake. These look so pretty. Love cheesecake, and just recently discovered white chocolate cheesecake. 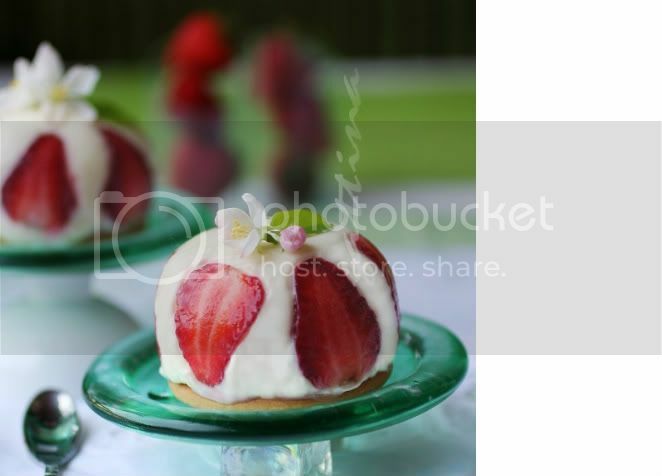 i'll would be thrilled if i see these cute mini cheesecakes being served, they look so pretty! !